Some of our main speakers, that will be in the conference from October 18-20. Claude Y. Laporte is a Professor at the École de technologie supérieure (ETS) an engineering school of the Université du Québec network of institutions. He teaches graduate and undergraduate software engineering courses. He did his undergraduate studies at the Collège Militaire Royal de St-Jean (Canadian Military College). He received his Master in Applied Sciences from the Electrical and Computer Engineering department of École Polytechnique de Montréal in 1986. In 1980, he received his Master in Physics (computerized instrumentation) from the Université de Montréal. He completed a Ph.D., under the supervision of Dr. J. Tisseau, Director of the National Engineering School of Brest (ENIB) of the Université de Bretagne Occidentale (UBO).He received a Doctor Honoris Causa from the Faculty of Engineering and Architecture of the Universidad de San Martin de Porres (Lima, Peru). Alvaro Manuel Reis da Rocha holds habilitation in Information Systems and Technologies, PhD in Engineering and Management of Information Systems, MSc in Information Management, and Bachelor in Computer Science. He is Professor of Information Systems and Software Engineering at University of Coimbra and an invited Professor at University of Santiago de Compostela and at University of Vigo.Álvaro Rocha holds Professorship Habilitation in Information Science, PhD in Information Systems and Technologies, MSc in Information Management, and Bachelor in Computer Science. He is Professor of Information Systems and Software Engineering at University of Coimbra, researcher at CISUC (Centre for Informatics and Systems of the University of Coimbra) and a collaborator researcher at LIACC (Laboratory of Artificial Intelligence and Computer Science) and at CINTESIS (Center for Research in Health Technologies and Information Systems). His main research interests are Information Systems Planning and Management, Information Systems Quality, Requirements Engineering, Software Engineering, e-Government, e-Health, and Information Technology in Education. He is President of AISTI (Iberian Association for Information Systems and Technologies) and Chair of IEEE Portugal Section Systems, Man, and Cybernetics Society Chapter. He is also the Editor-in-Chief of JISEM (Journal of Information Systems Engineering & Management) and the Editor-in-Chief of RISTI (Iberian Journal of Information Systems and Technologies). And he is Vice-Chair of Experts in the Horizon 2020 of the European Commission, Expert in the COST – intergovernmental framework for European Cooperation in Science and Technology, Expert in the Italian Ministry of Education, University and Research, and General-Chair of WorldCIST (World Conference on Information Systems and Technologies). Gonzalo Cuevas was born in Spain in 1940. He received the Engineer degree in Telecommunications and the Ph.D degree in Telecommunications from the High School of Telecommunications, Polytechnical University of Madrid, Spain, in 1965 and 1974 respectively.Founder of the Software Process Improvement Investigation Group in Spain. Tomás San Feliu was born in Spain and holds a PhD in Computer Science. He is an Assistant Professor in the “Facultad de Informática” at the “Universidad Politécnica de Madrid”, UPM, Spain. He teaches Software Engineering, specifically software process management and improvement. He has participated in more than 20 research projects (European, Spanish public administration as well as with private enterprises). He is author of more than 50 international papers. He is also the author of books related to software process improvement and software engineering. He is a member of the “Research Chairs for Software Process Improvement for Spain and the Latin American Region” and has been a member of the team that translated CMMI-DEV v1.2 and v1.3 to Spanish. Manuel Pérez Cota is Professor and Researcher at the University of Vigo (UVIGO) in Vigo, Spain. He has a degree in Electrical Engineering (Universidad La Salle) and Electronics and Communications Engineering (Universidad Nacional Autónoma de México – UNAM, 1980), a PhD in Industrial Engineering (Universidad de Santiago de Compostela, 1990). 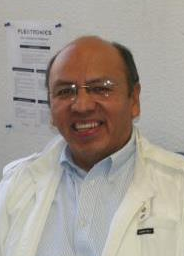 He is the director of the international research group SI1-GEAC (http://cuautla.uvigo.es/si1-geac/). He was the first director and developer of the Computer Department (Computer Science School of the University of Vigo). He collaborates in different Master and PhD programs in Spain, Portugal, Germany, Finland, Argentina, Bolivia and México, and has been supervisor of several PhDs. He has been involved in different European and International projects. He has published quite extensively and has many publications (including books, book chapters, Scientific Citation Index journal articles, and international journal articles, as well as publications in refereed conference proceedings). He is a member of different international committees and associations (ACM, IEEE, AISTI, AIPO, ANALCT). Stewart R. Santos Arce (S07-M’09-SM’14) received the degree of Engineer in Communications and Electronics from the Universidad Autónoma de Campeche, in 2007, the title of Master of Science and Doctor of Science, both with Specialty in Electrical Engineering, of the Center for Research and Advanced Studies of the National Polytechnic Institute (CINVESTAV) in 2009 and 2014 respectively. He is currently a full-time research-professor in the Department of Electronics at the University Center of Exact Sciences and Engineering at the University of Guadalajara. His main research interests focus on parallel neuronal computating for real-time digital signals applied to processing, analysis, segmentation and feature extraction of remote sensing images. In IEEE, he has participated as Student Activities Committee chair (SAC), Young Professionals chair (YP), Communication Society Treasurer (COMSOC), Membership Depelopment and IEEE Guadalajara Section vice-chair. He currently serves as president of IEEE Guadalajara Section, during the period 2017-2018. Jose Gabriel Suarez-Delgado studied at National Politechnical Institute, ESIME, ZACATENCO, is currently president of IEEE, Aguascalientes section. Director of Informatics Planning at INEGI. PhD in Computer Sciences. His professional objective is design and implement key strategies to provide competitive advantages and innovative solutions based in the rational application of ITC, contributing to the enterprise leadership in all its areas. His professional experience is on Strategic Planning, IT Management, IT Governability, Coordination, Software Engineering, Enterprise Architectures, Software/System architectures, Programming, Databases, Information Security, Datacenters, Technical Support, Helpdesks, GPS Systems, IT Research, Education, Standards, International Collaboration, Virtual Teams. Juan Jose Raygoza-Panduro studied the degree of Engineering in Communications and Electronics at the University of Guadalajara, received the Master Degree in Sciences at the Center of Research and Advanced Studies of the IPN, Zacatenco, Mexico. His doctoral studies carried out in Computer Science and Telecommunications in the Superior Polytechnic School of the Autonomous University of Madrid Spain. He also worked at IBM, participated in the transfer of the IBM Hard Drive Manufacturing plant in San Jose California to GDL Plant. His research areas are architectures of microprocessors, neuroprocessors, System On Chip and digital structures based on FPGAs, as well as Electronic Systems Applied to Biomedicine, Digital control, and embedded systems. He is currently Research Professor at Department of Electronics, CUCEI, University of Guadalajara. Victor A. Bustos y De La Tijera, Ph.D.
Victor Alfredo Bustos y De La Tijera holds a degree in Actuary from the Faculty of Sciences, in UNAM, Master in Statistics and Operations Research by the Institute of Applied Mathematics and Systems Research by UNAM, and doctor in Statistics by the London School of Economics and Political Science. He has been a professor at the Faculty of Sciences of UNAM, professor-researcher at IIMAS-UNAM and professor at the School of Business Administration at Temple University, ITAM and at ITESM, professor-researcher at the Center for Research and Teaching Economics, as well as guest professor at the IBM Science Center in Mexico. Other academic and professional distinctions include those of National researcher Level 1, elected member of the International Statistical Institute and president of the Mexican Statistics Association (1993-1994). He is a member of other associations and collegiate bodies in the field of information technologies and statistics. He has published papers in national and international specialized magazines and participated as a speaker in various congresses and events in both statistical and IT fields (more than 100 papers). Among other areas of interest are: model adjustment based on survey data, use of Markovian models, multivariate classification, use of ICT in efficient information collection, alternatives for the construction of time indices and comparison of algorithms selection of samples. He is currently a researcher at the General Associate Direction of Research of INEGI, which he joined in 1991.